Look at that gorgeous winter sky… I would love to take the 6km walk… and then a picnic on the beach. Thanks for the great map. One last thing, it’s funny you should include the Pipe Track in your Google Maps hikes… because I lived on Theresa Ave when I stayed in Cape Town!! The view from my penthouse windows was stunning. My son was concieved there… Oh, the fond memories! 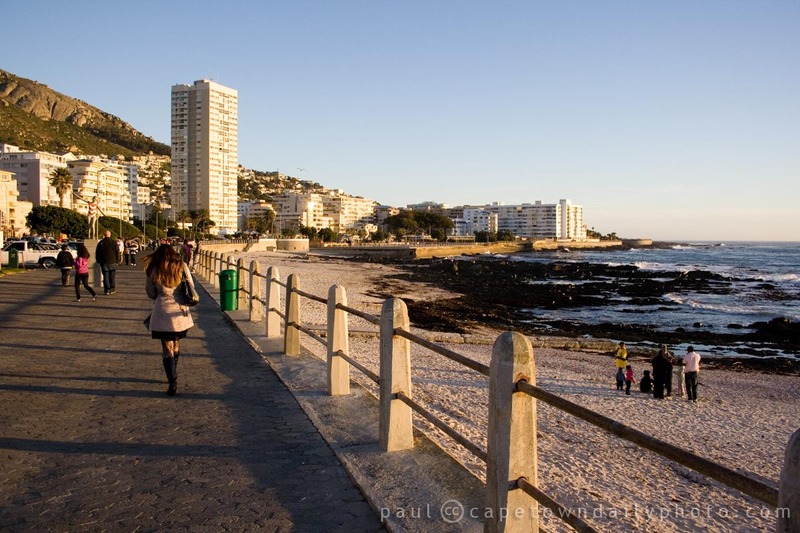 I was delighted to find that I am on Google Street View at Mouille Point! We were on the promenade munching schwarmas from Ari’s Souvlaki when the trike went past and then had to wait until it went live to see – and there we are! I know some people have privacy issues about it, but I couldn’t be happier, a little bit of me will always be there if only virtually! and what about the beautiful trees bent by the wind? I found them very funny. That promenade is fantastic. I love walking there looking the ocean and breathing the strong sea “parfume”. I’m looking forwards to be there again. I will be back in Cape Town on the 15th of July, at last… here in Italy now it is too warm and humid, for my taste!!! !